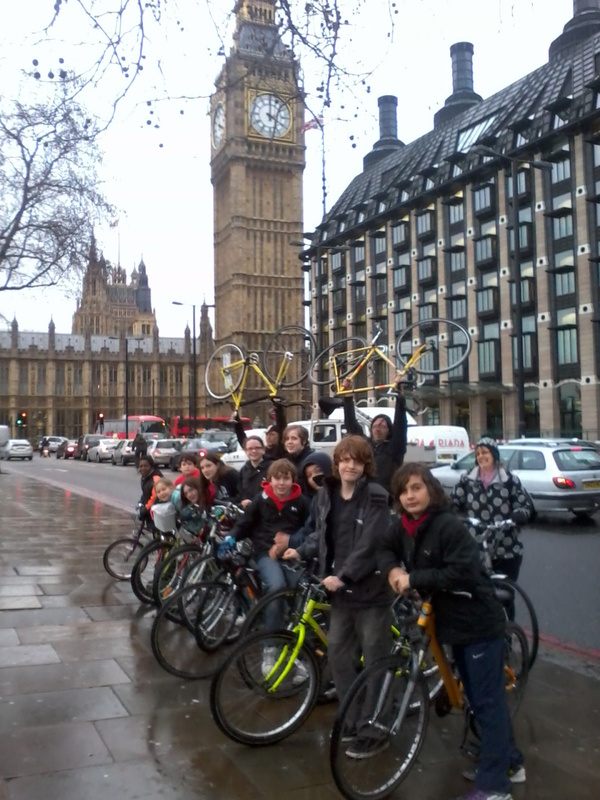 Lambeth Cyclists’ Architecture Ride in December, led by Charlie Holland, offers an exceptional opportunity to join the very few who have climbed the 334 stone spiral steps in the Houses of Parliament clock tower to see and hear Big Ben strike the hour right up close! (I did this for Pedal Power Kennington last year, see the photo above, and the teenagers loved it, but the adult ride leaders loved it more). Sir Charles Barry was chosen as the architect to design the new Houses of Parliament after the fire of 1834, and he selected Augustus Pugin as his assistant. Starting at Clapham Common Bandstand, we’ll ride to Portcullis House for the Clock tower tour, then ride to look at other works by Barry and Pugin, and have lunch, before returning for a tour of the rest of the Palace of Westminster. Booking no later than Sunday 20 November is essential for security clearance. Please only ask for a space if you are CERTAIN YOU WILL BE ABLE TO ATTEND ON THAT DATE. There are only 16 places on the tour so book early! You MUST return the security clearance info below on requesting your place, and we will contact you to confirm your place. For security reasons, it is the House of Commons' policy to obtain security information on all visitors wishing to tour the Clock Tower. All visitors must have a full UK address at which they permanently reside. Children under the age of 11 are not permitted to participate in the tour. The booking information will be passed to the Police for vetting. Tours of the Clock Tower cannot be provided to overseas visitors. Each visitor (aged 18 or over) should bring two forms of identification, one with their home address, the other with photographic ID. Passport, driving licence, utility bill or official letter. Owing to the nature of the tour, it is not suitable for all visitors and requires a certain degree of good health and fitness as you will be required to climb 334 stone spiral steps.If you are in any doubt about your ability to participate in the tour you should consult your doctor. Sensible shoes must be worn. Please email the following information to Charlie Holland Charlie@palaceofvariety.co.uk no later than Sunday 20th November to book your place (1st come, 1st served).